A couple was caught on video allegedly harassing a female Shah Alam Municipal Council Officer (MBSA) that has been making rounds since approximately 10.00pm last night. The video begins in the middle of the altercation with the woman holding on tightly to the officer’s shirt, while the husband stands on the other side, blocking her path and preparing to take her picture. It would seem that the conflict took place when the officer issued a summons to the couple’s vehicle at Bukit Rahman Putra in Sungai Buloh. From the dialogue throughout the video, some comments from the couple imply that the officer had reacted physically to their dispute. “Tengok, awak yang buat saya merah-merah. Awak yang cederakan saya.” (Look, you made my skin turn red. You injured me). The officer, perhaps in fear, lost her patience and began shouting at the couple, while trying to block the husband’s attempts at snapping a picture of her. All the while the couple kept blocking the officer’s attempts to break free. It seems that the couple had intended on reporting the officer’s alleged misconducts to the police, but had gone too far in their attempts due to the heightened emotions of the situation. After even an impartial motorcyclist failed to disperse the situation, the other officer who was also at the scene managed to pull her colleague away from the couple and they walk away. 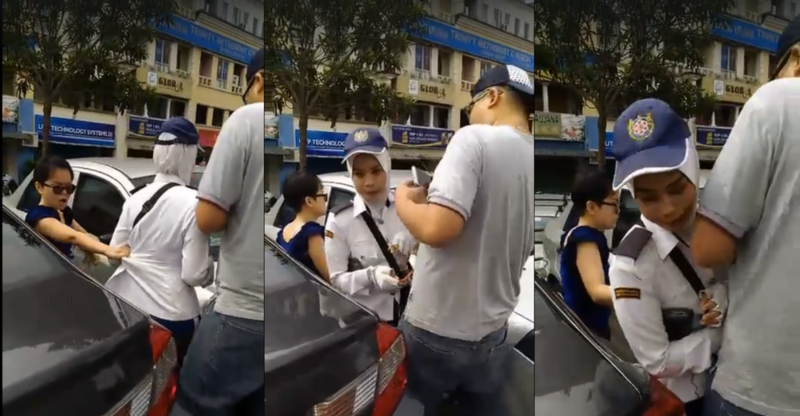 With the couple being of Chinese descent and the officers being Malay, it stands to reason that the video gained the traction that it did in Malaysia’s current socio-political climate. The act of crowding a small-framed woman, even if she is an officer, could also be seen as an act of intimidation. Most of the comments in this video were in support of the officer, as it was seen that the Chinese couple were out of bounds. 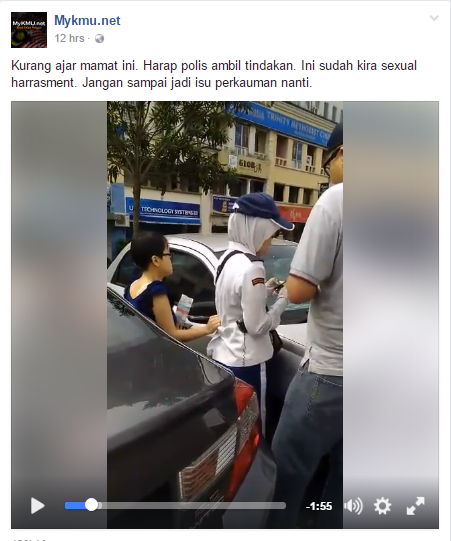 The most viral version of the video posted by Mykmu.net even made a comment on sexism, despite the fact that the person who was holding on to the officer was also a woman. Screenshot of mykamu.net’s Facebook post. And there were many comments that agreed with the sexual harassment sentiment. Translation: What a terrible guy. He clearly does not understand the meaning of respecting women. The Chinese guy blocking the way was in the wrong and so was the woman who kept pulling on the officer’s uniform. Translation: I hope the police will take action soon. Sexual harassers! 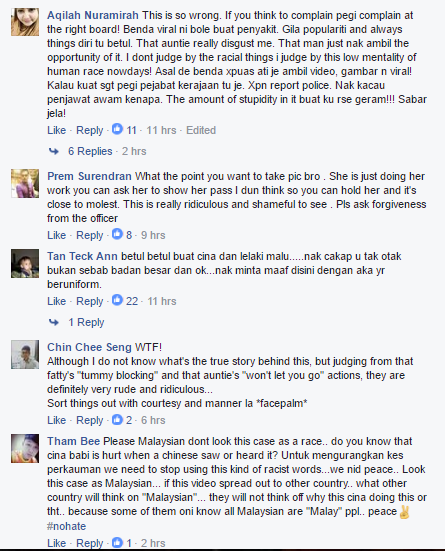 Many Chinese-Malaysians quickly took to the comments to denounce the couple responsible, and insisted that not all Chinese-Malaysians were like this. They displayed a strong spirit of unity and respect for other races that this country was founded on. Translation: Not all Chinese are like this a**hole. I am sorry about this. If I find these “cina bukit” I would give them a high-five to the face. Translation: Please trust that the Chinese population will not back these two up just because we’re of the same race. We know that Malay women cannot be touched carelessly, and we understand that the officers have a job to do. The attitude and actions of the two simply goes too far and is an embarrassment to the other Chinese people. Translation: This issue is too much. If it were me, even I would lose my temper. But remember, please don’t mention or blame the race of the perpetrators, and instead judge them as individuals. Just they wait until action is taken. Others insisted that the law enforcement should take action on this issue. Translation: I’m sure the victim has already lodged a polie report. If they haven’t it’s in their best interest to do so as there is no info that can be taken as a guide as to where this case took place. Translation: Admin, (referring to the admin of Mykmu.net) I hope you’ll be able to follow-up on the actions that were taken by the authorities. Disrespectful & rude. This is what we call an as*hole. If my younger sibling happened to have been that office, I would beat that knave up, like Papagomo had to the man that bothered his younger sibling. Some would argue that the actions were a clear sign of disrespect for the law and its executors. Translation: The attitude of the Malaysian people that are taught not to respect the law. Translation: It’s almost like a new culture. They will provoke the authorities, then take a video to fish for support. Then, the supporters would mock the government. Overall, while there were some comments on the video clearly reeking of racial sentiment, many more Malaysians took to the platform to decry the couple as individuals. They chose to judge the couple by their actions rather than the colour of their skin. A majority of the comments have taken the side of the traffic officer, but as the full story has yet to emerge, before heaping vitriol on the couple, we should take a step back and maybe wait before posting an angry diatribe. After all, if more details come to surface and this was not what it seemed, then a lot of people have reacted before getting the true facts, which is an unfortunate byproduct of our modern age.